The early land plant Nothia aphylla found in the Rhynie chert below the hill with the obscure name Tap o' Noth shows a unique structural component: aligned tube-like cavities called "giant cells" in , where it is claimed "that they are true cells". Observations  have led to the conclusion that the big tubes most probably are of a more complex origin involving the dissolution of numerous cell walls. Independent of this feature it seems appropriate here to draw attention to the fact that the spore capsules of Nothia are seen in a variety of shapes on the surface of the chert samples and on cut faces, hence it may be difficult to tell them apart from capsules of Horneophyton and Asteroxylon which are often found together with Nothia in the same sample. (Sporangia of Asteroxylon are rare.) While the more abundant spindle-shaped sporangia of Aglaophyton are easily recognized by their mostly elliptical or circular sections, the irregularly shaped more or less bulky bags which are the Nothia sporangia may provide odd-shaped sections beside occasional circular ones. 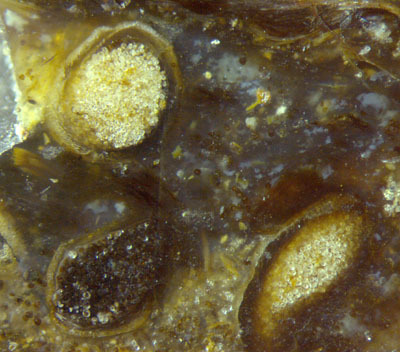 Xylem strands and sporangia with spores are obviously more resistant to rot than the soft tissue of the plant so that they are closely stacked in some places in the chert. 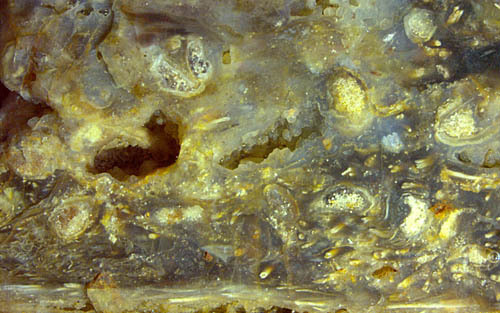 Fig.1 with drawing: Nothia sporangia and xylem strands on an old fracture face of a chert layer smoothed by weathering. 14 sporangia are visible on this area of less than 2cm2. Note also the numerous persistent xylem strands below. Apparently the shapes and sizes of the sporangia vary within wide bounds, which is obvious from the three pictures below, with equal scale. Some are nearly globular, others are flat like the uncommonly wide one in Fig.3. Beside the variability of the capsules, the tube-like cavities in their walls are worth looking at closely. 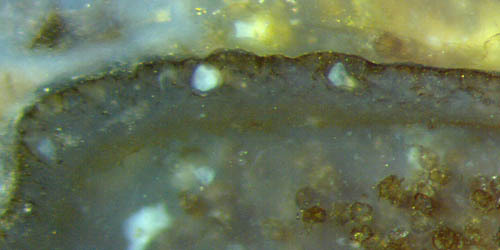 Although the sporangia seen in the chert can be numerous, the tubes in the wall are seldom preserved such that they are clearly visible, and if preserved well, they are not well seen when tilted with respect to the cut plane. Hence, the below pictures taken with incident light on arbitrarily cut faces have been brought about by lucky coincidences. Fig.5 (left): Three cross-sections of wide tubes below the surface of a Nothia sporangium, with pale fill. 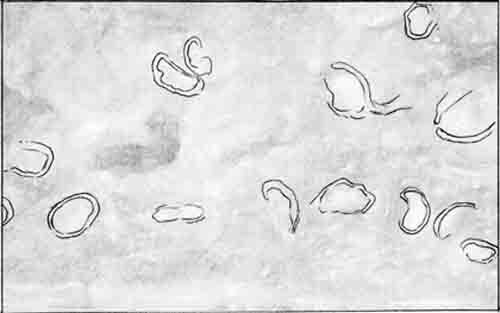 Fig.6: Two sporangia of Nothia, the left one being in the depth and thus seen from outside. Fig.7: Detail of the capsule wall in Fig.6: wide tubes hidden behind the long narrow strips between the cell files. From the complex structure of the capsule wall as seen here and in  it can be concluded that the evolution of Nothia involved quite a number of developmental steps, which distinguish it from other "early land plants" and suggest a closer relationship with the more advanced zosterophylls, which has been suspected  but apparently never confirmed. 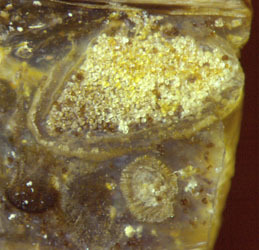 As a well-known fact, tiny contaminations in the silica gel can largely affect the aspect of the chalcedony owing to differential silica grain sizes formed in silicification. Hence, the white fill in some of the tubes possibly indicates a content which had been chemically different from the surrounding tissue before silicification, which would be compatible with the idea of tubes releasing poison or glue if tapped by creatures trying to get at the tasty spores. This idea differs essentially from others proposed in , including "large water reservoirs". Since the surface tension of liquids is a dangerous force for small creatures, an earlier statement  may be repeated here: "If tapped by a spore eater, a tube under pressure would spill its content profusely and soil the biting creature with sticky liquid with possibly fatal effect." 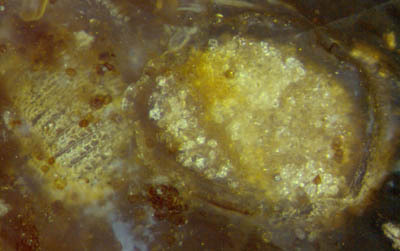 All pictures have been taken from one chert sample of about 0.25kg found in 2003.